The ETEK5 Paintball Marker with it’s sleek Blue & Black design is now in its 5th generation, it holds true to the same basic principles of durability and reliability. It pushes the boundaries of what has come to be expected from a mid-range marker. 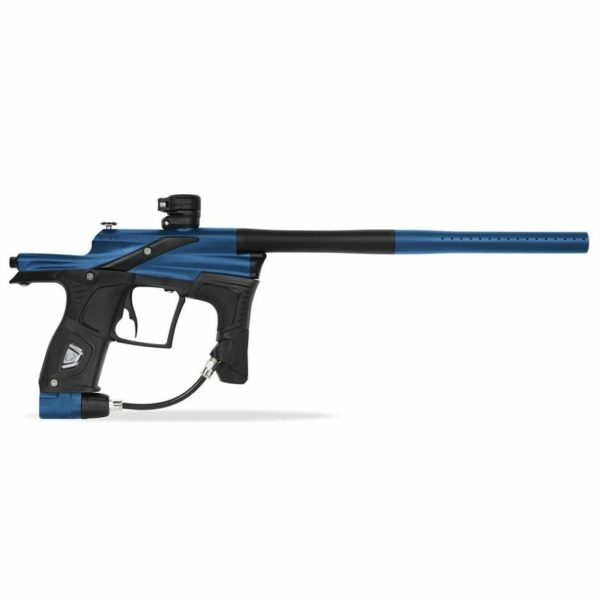 The ETEK5 Paintball Marker – Blue & Black now in its 5th generation, it holds true to the same basic principles of durability and reliability. It pushes the boundaries of what has come to be expected from a mid-range marker. The ETEK5 Paintball Marker – Blue & Black has achieved this by using the trickle-down effect of features and ergonomics from its class-leading high-end siblings. For example, the ETEK5 borrows its basic architecture and form from the incredible EGO LV1. Its integrated LPR assembly and SL4 inline regulator ensure the ETEK5 operates with exceptional consistency whilst employing an extended pitch between the foregrip and gripframe, providing the most stable and comfortable shooting platform possible. The all-new dual-density wrap-around grips and foregrips not only look the business, but also use our latest stippled inserts to give the user a higher level of grip and control, regardless of playing conditions. The ETEK5 Paintball Marker points accurately and naturally whether snap-shooting or running and gunning. Internally, the ETEK5 now incorporates Zick3 technology which introduces a true 2-stage acceleration profile. 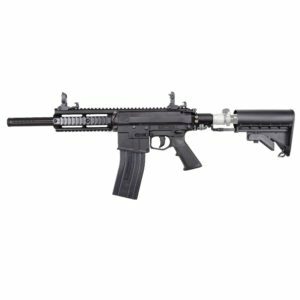 This provides a very gentle initial acceleration to the bolt and ball which then increases during the 2nd stage of the bolt stroke to enable super-fast rates of fire. It enables the ETEK5 to be gentler on paint whilst also reducing recoil. On top of that, the ETEK5 Paintball Marker operates at much lower pressures compared to previous ETEK models. The much larger valve chamber combines with the high-flow valve and new soft-tip Cure5 bolt to deliver an HPR operating pressure of around 150psi and an LPR pressure of 85psi. The result is a quieter, smoother shot as well as having the added benefit of being gentler on paint both in the breech and in the barrel. For those wanting to take things a step further, the ETEK5 has the option of a graphical user interface through the optional OLED display upgrade. The OLED upgrade empowers the user to quickly and easily adjust the marker control parameters, such as firing mode, dwell and to monitor breech sensor status, battery level, shot count and the actual rate of fire in real-time. Semi and ramping firing modes are fully configurable to comply with the requirements of every major paintball league. The ETEK5 Paintball Marker continues the platform’s recent success of combining advanced lightweight and durable composites in core areas of the marker. They are more than up to the job of carrying the Eclipse name for reliability in any condition.